When running a web shop there is always need to somehow keep your customers posted with the new information. It can be done in different ways, but using push notifications seems like a pretty neat and convenient way to do it. This technology has been around for some time now but unlike mobile apps, there aren’t many websites that actually utilize it. There’s probably not enough buzz about it out there and to be honest, for certain channels, the technology is not quite ready yet in terms of development. Nevertheless, let’s check it out. Implementation of push notification feature differs depending on a mobile platform and a web browser we are targeting, but the core principle of the technology is the same in all cases. 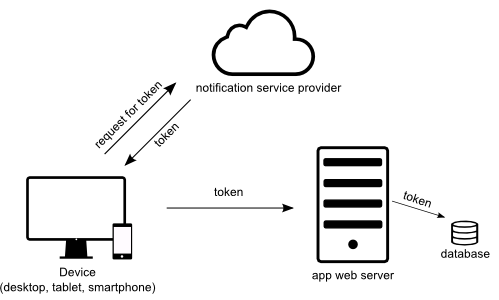 If we choose to receive push notifications then mobile app or a web browser makes a request to notification service provider which generates a unique token for our device and sends it back to the app/browser. Token is then sent to the web server of our choice which stores it in the database for later use. To send push notifications we use tokens which were previously stored in the database. Think of a token as an address of a device which should receive a message. 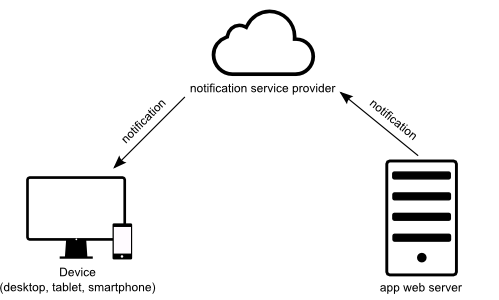 Notifications are not sent directly to devices but instead to notification service providers which are responsible for its delivery to the end users. Which notification service provider we are referencing depends on the platform we wish to target. and from up until recently MWPS (Mozilla Web Push Service) for Firefox browser. There is no universal standard which defines how notification providers should implement their service and how it should work. Therefore, every provider has its own way of implementation with different requirements and limitations. From developers point of view that kind of makes things more complicated. That’s all well and nice but you are probably wondering how do I implement this in my Magento store? 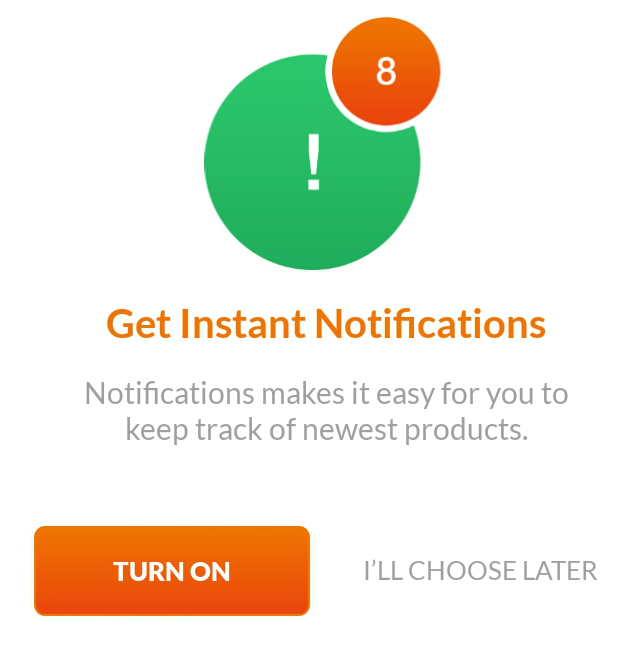 Well, one of our clients requested of us to implement push notifications system on his Magento web shop and to cover two platforms – Apple (OSX and iOS mobile application) and Google (Chrome browser and Android mobile app). In the following text I’ll try to briefly cover the way we implemented it and the problems we faced along the way. I won’t go into details of our module or it’s structure. Instead, I’ll focus on parts which are specific for push notifications system and necessary in order to utilize it. make it easily expandable with additional new channels in the future (Firefox, Edge…). Before we go over these steps I would like to give you links to the documentations since I’m gonna be referring to them later on. So, Google and Apple. Implementation of opt-in and subscription creation process is different depending on a platform. I won’t go into mobile app side of the story since I’m not competent to talk about it. Instead, I’ll give you an example of how it can be done for web platforms – Chrome and Safari. Important thing to note is that service workers function on secure connections only. In other words, if your site is not on https Chrome push notifications simply can’t work since service worker can’t be registered on insecure connections. If the given browser version supports all push requirements Chrome will display opt-in pop. However, opt-in pop up will be displayed only if Chrome has no data about notification permissions for the given website. It serves as initial push notification setting for a given page which Chrome saves internally under its configuration settings. If we forbid Chrome to show push notifications the only way to enable them back is via settings menu. More precisely under: Settings – Content Settings(under Privacy section) – Notifications – Manage Exceptions. "gcm_sender_id": "<Your Project ID Without the Hash>"
You’ll notice the parameter called gcm_sender_id or project id. In order to obtain it you need to create a new project for your website through google developers console. If you are not familiar with how to do it just follow the google documentation, section “Make a Project on the Google Developer Console”. At this point we have a new Chrome browser associated token in our database. You’ll notice the parameter web_site_push_id. It identifies your website with Apple push service. You need to create one from your apple developers account. If your are not familiar with how to do it you can follow these instructions. If there is no notification permission data for the given website (permission equals ‘default’), Safari will ask for a permission i.e. try to display an opt-in pop up. But things are not that simple as with Chrome. In order to display opt-in pop up Safari first makes an ajax request to an url of our choice and expects a valid zip package to be returned. In order for a zip package to be valid it needs to be signed with a valid .p12 certificate and have very specific content and structure. For more information on the package itself and how to generate it check out the documentation under section “Building the Push Package” section. If returned zip package is valid then opt-in pop up will get displayed, otherwise we’ll get an error in our console log. At this point we have a new Safari browser associated token in our database. All tokens that were imported to Magento can easily be viewed through Magento admin. channel type (chrome, safari, ios, android or some other in the future) – which is necessary to differentiate tokens from different channels. All this information is useful if we want to do some kind of segmentation of our customers when it comes to push notifications or to create different messages for different websites and languages (store views in Magento). channel type – which defines a platform for which certain message is intended for. In addition to those parameters, admin can define a resource which notification will display once user clicks/taps on it. This can really be anything, some product page, category page, cms page, search link, some external link or something else. Once message is created it needs to be scheduled for sending in order to get picked up by a sending script. Messages are being sent periodically by cron. Since channels differ in a way messages are sent, every channel has a php class associated with it that handles the sending process and potential errors. This way we can add a new channels in the future without much trouble. To send Android and Chrome push notifications we need to communicate with the GCM. In order for the GCM to accept our request we need a valid API key which authenticates our server with the GCM. API key is obtained through google developers console for the particular project. Just follow the google documentation if you are not familiar on how to do it. Just a small digression, in the documentation, message data is also referred to as a payload. I may use this word in the following text so you know what I mean. Once we successfully deliver message data to GCM our work is done. It is up to GCM itself to deliver messages to the end users. With Apple things are a bit more complicated than with Google. According to the documentation all communication with the APNS has to go over the secure TCP socket connection and data needs to be sent in a specific binary format. As you’ve probably noticed, to encrypt a communication with the APNS we need to pass a local certificate to the socket client as an option of stream context. Funny thing is, obtaining of the certificate actually gave us lots of trouble since apple documentation really lacks any useful information about the certificate or on how to obtain it. After lots of searching, trials and errors we found this tutorial, which turned out to be very useful. As you’ll see for yourself, process is quite extensive and somewhat complicated, especially if you are not an Apple user and not familiar with the system. If you are just starting your work on this matter you should definitely go with the new binary interface and format your messages that way. You can find all details about it in the documentation. We’ll eventually have to refactor our extension to adopt this new standard, but the legacy one works just fine for now. At this point it is up to APNS to deliver message to the end user. Once push notification reaches a device it somehow needs to be displayed to the user. On Apple’s OS X devices this process is handled automatically since the whole push notification system is integrated in the operating system itself. That basically means that if you format your notification message correctly you don’t have to do anything to display it to user, it all happens automatically. For mobile applications on iOS and Android there are certain things that need to be implemented on the app side but I won’t go into it since I’m not competent to talk about it. But what I will show you is how to display a notification in Chrome. As mentioned before, Chrome uses service workers to display a notification message. When service worker is registered with Chrome, it is registered for a specific domain. This way, when GCM pings our browser it checks whether there is a service worker associated with the domain from which the notification is coming. If so, Chrome dispatches a push event which gets picked up by a service worker which does the rest of the work. If you take a closer look at the code you’ll notice something strange. We are grabbing notification data from remote url instead of getting it from the event object. Why are we doing that? Well, as I said in the first few lines of this article, for some channels push technology if not quite ready it terms of development. Chrome is exactly what I had in mind by saying that. At the moment GCM is not delivering message payload to Chrome. The reason for this is that in a future implementation, payload data will have to be encrypted before it is sent to a GCM. So basically, you can send payload in your curl request but it won’t be delivered to the browser. This kind of makes Chrome push notifications useless, or at least very limited in terms of functionality. To overcome this problem and ensure at least some kind of Chrome push functionality for our client, we decided to grab notification data from a file on our server. File is populated with the data of the last Chrome message that gets scheduled from Magento admin. I didn’t cover it in this post since I wanted to focus on initial subscription process and show you how to get up and running with this whole push notification thing. Obviously, you can unsubscribe by going into your browser settings and block push notifications for a particular site. That’s one way of doing it. Aggressive, if you wish. Documentations have some nice examples on how it can be done. This one was a beast to write. I know, it’s a long one, but there are just so many things to cover. Hope you managed to follow along. I tried my best to be as concise as possible. If you find any mistakes or think that something is missing please let me know. It looks really awesome! Please share the module, or sell. Please! Thanks for the info Kresimir, I recently just got into the world of eCommerce using Magento platform. I would like to know if there is a way for the one handling orders (at the backend) to receive push notifications when an order has been made on the eCommerce site. i like to know by when this Magento extension can be out for downloading ? You can already find some extensions on the marketplace, or you can create your own, as Bryan said 🙂 Good luck! Very cool. Would be awesome if this was available as an extension. Great work Kresimir! Hi, i’m beginner with magento. I don’t know where i can put files with your code and how to use it. Wow Kresimir, you have summed up push notifications in great detail. We have built a Magento extension which does this automatically even for non HTTPS Magento stores. I hope when the plugin is live you will like it. Just read your great blog post a day before our extension going live is great. It validates the idea and yes, it has limitless opportunities. On a side note on CentOS 6.5 the default Magento API caller doesn’t work, did you come across that issue? We ended up using FSOCK to solve it.